Ergonomics Article - Why is Ergonomics Important? So are you looking for an ergonomics article telling you why is ergonomics important? Do you notice a strain in your neck, shoulders or wrists? Maybe, maybe not. But as the years roll along, we would have weakened our core muscles by sitting too long. We may have developed a stooped posture and forward neck because our computer monitors are too low. We have strained our wrists and some of us developed carpal tunnel. Even after painful surgeries, they are not reversible. Why? These computer injuries are not noticeable day by day but over time, we slowly develop what is known as musculoskeletal disorders. Increasingly, we have been relying on technology to live life. We spend more hours at the computer and television than any other time period in history. When we are not tending to the computer or television, we are in a stooped position over our smart phones, such as the iphone or other handheld gadgets such as the ipad or the ipod. Children spend hours at end with their handheld video games. What are the health implications for this? No doubt that with these gadgets, some can say that our lives are made easier. We enjoy the convenience and entertainment value that technology and its respective gadgets make. But as a result, our bodies are paying the price. Increasingly, users of these technology products such as the laptop and smart phones have reported back and neck pain, eye strain amongst other shoulder aches, wrists pains. Children are increasingly overweight because of the lack of movement. They either sit and study at their laptops or are looking down at their video games, therefore resulting in bad posture development. <4>Why? The reason is because of the lack of ergonomics. The lack of knowledge of ergonomics or the lack of applying ergonomics goes hand in hand. That is the key to establishing a healthier work and home life. Many people think Ergonomics is simply about buying a better chair, or mouse. It is more than that. It is also about applying the right posture and good work habits. Ergonomics is the science of designing what we use to fit the way we use our bodies. The aim of Ergonomics is to make and design the use of technology and gadgets, such as your computers, hand-held mobiles etc to be as user-friendly as possible. This also means using them would be in a "natural way". To explain this "natural way", let us agree that it is natural for us to stand in a posture with our necks and heads to be aligned in a straight line with our eyes looking ahead. Now it would be unnatural for us to walk with our necks forward and our eyes looking 45 degrees downwards for hours and hours, won't you agree? So, the latter example would signify the lack of ergonomics. But we all don't realize that it is the latter that we are doing everyday at our workstations! In Ergonomics and it's lingo speak - a 'natural' position is also known as a 'neutral position', just in case you were wondering when you were reading other ergonomic articles. Sadly, some of us don't realize why ergonomics is important until it is too late. That is why I wrote this ergonomics article as a reminder to myself and put the word out there. Don't wait until you develop serious computer injuries to realize that we are looking downwards at our laptop screens and iphones for hours. By doing so, we are subjecting our neck and muscles to be in a static position. Which are bad, bad, bad for you. Our bodies weren't designed to stay still in unnatural positions all day - such as sitting. Sitting is a learned posture. The chair is a modern invention. When we were babies, we sat on our bottoms and squat. While we work hard at our desk, we don't realize that sitting for hours causes the enormous pressure equivalent to several times our body weight on our backs. Sitting for too long weakens our core muscles too, which are what we need to breathe better and maintain good posture. Start your Ergonomics Education Today! All the above problems can be minimized or eradicated by the knowledge and application of ergonomics. You can apply the principles of ergonomics to your workstation, your home and whenever you are using any product. While I was doing research for this ergonomics article, people often think the application of ergonomics requires a tonne of money spent on products labeled "ergonomic". The reality is while there are many well designed ergonomic products, they not necessarily reduce your risk if you use them wrong. Honestly, most of the times, after reading a couple of ergonomics articles, you'll realize that sometimes all you need is a little adjustment of how you use your computer and gadgets. As a result, we have a healthier work-life, feel more productive and satisfied and will not pay for aches and pains as the years roll along. This ergonomics article is only the beginning. Invest some time now to browse through this specially compiled list of articles. SHOP ergonomic computer accessories here. SHOP portable ergonomic laptop desks here. These are mainly medical names for computer injuries that can occur due to the lack of ergonomics. Some are irreversible, so it's better to read about them in order to prevent them! Is the position of your monitor causing your neck pain? SHOP anti-glare computer accessories here. SHOP ergonomic typing accessories here. Some basic ergonomics information which you can apply today - just to start you out with. You can look for more ergonomic articles on the left hand navigation bar, or use the search button located on the top left hand side of the nav bar. SHOP ergonomic office products here. A series of exercises that anyone can do on their desk at work. These ergonomic articles are not exhaustive, but this is a convenient page to bookmark if you are looking for office ergonomics information. If you are looking for more ergonomic articles, look for the search button at the top left hand corner of the navigational bar. Thank you for reading 'Ergonomics Article - Why Ergonomics is Important'! 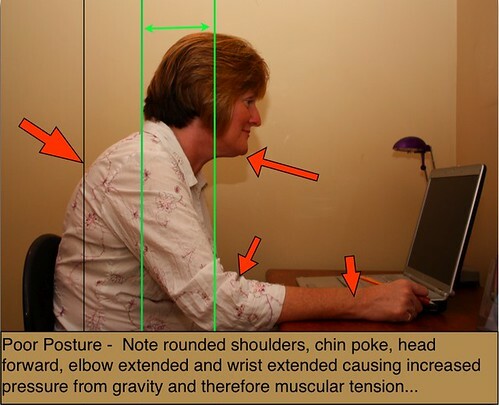 If you enjoyed reading this ergonomics article, please pass it on!